Brookefields is the first of its kind retail project in the city of Coimbatore. With several anchor retail outlets, leading local, national and international brands, hyper markets, food court, family entertainment centre, multiplex, parking - all under one roof, it is the ultimate shopping and entertainment experience! The mall promises something for everyone with its bewildering range of products spread over an area of about 4,50,000 sq. ft. Its great location and connectivity make it a convenient destination for locals and tourists alike. 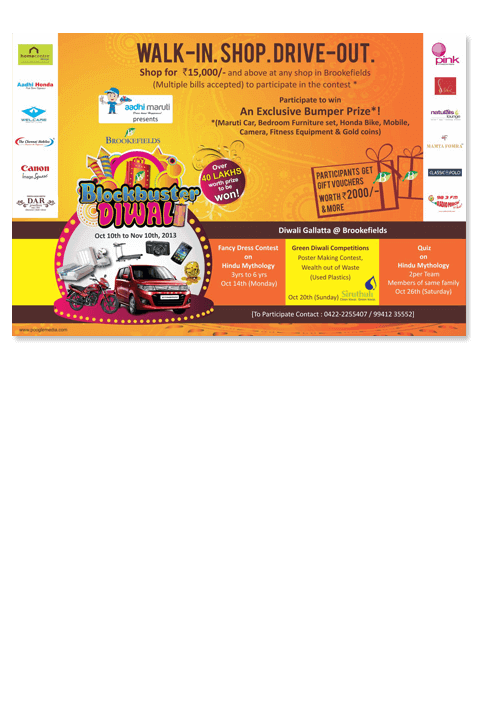 Poogle Media were approached to create their Diwali event block buster event branding. At Poogle, the creative phase involved in designing a colourful logo design, attractive posters, ticket design and print ad.